Keep track of El Niño/La Niña through posts in this category. Signs of change for 2016? After a couple of false starts in recent years, a strong El Niño finally developed and is now firmly entrenched across a good portion of the equatorial tropical Pacific. This El Niño event has led to a substantial increase in Northern Hemisphere tropical cyclone activity, mainly in the Pacific (obviously), increased storms for parts of western North America with more to come in the weeks ahead and a fairly wet pattern overall for much of the South and Southeast U.S. The outlook from the various groups who monitor El Niño calls for a gradual weakening of this warm event as we move in to 2016. In fact, there is some evidence in the long range climate models that perhaps a cooling phase of what is called ENSO (El Niño Southern Ocscillation) is in store by 2017, if not sooner. Once past the winter and the influence of the current El Niño, things begin to look very interesting for next hurricane season for the Atlantic. One glaring consequence of this year’s El Niño was the record level of wind shear across much of the Caribbean Sea. Strong upward motion in the tropical Pacific resulted in strong wind between about 5,000 feet and 40,000 feet across the western Caribbean and extending as far east as the Lesser Antilles at times. This is what caused would-be hurricanes such as Erika to weaken and ultimately dissipate. Only a narrow band of favorable conditions existed in the deep tropics where we saw hurricanes Danny and Fred form, far away from land areas. 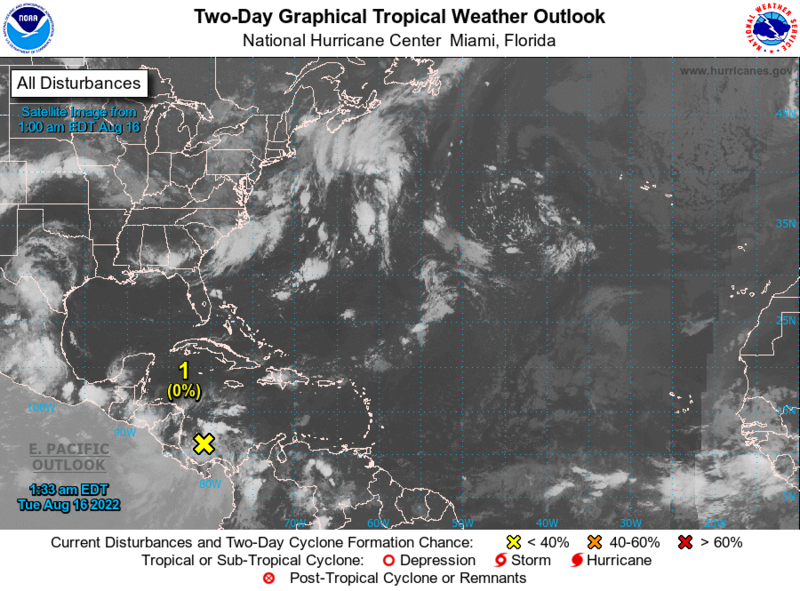 Outside of the extreme upper level winds, in the southwest Atlantic, there was another area of favorable conditions and the resulting hurricanes Joaquin and Kate owe their existence to that fact. Otherwise, El Niño really did help kill off the Atlantic season as far as direct impact on the United States was concerned. 2016 might not have that protection and in fact, there is a good chance of that happening, according to the latest projections from a suite of computer models. As of the December 10th update from the CPC/IRI (Climate Prediction Center/International Research Institute), the probability of El Niño conditions holding on through March 2016 are near 100%. After that time, things change quickly. Once we get to spring, El Niño begins to fade as cooler water moves in from the subsurface and stronger trade winds resume across the tropical Pacific. This is reflected in the projections with the probability of El Niño conditions dropping to 60% by late spring. Moving further out in time, the various models suggest only a 20% probability of El Niño holding on by mid to late summer 2016. This has huge implications on the Atlantic hurricane season since the absence of El Niño by itself is typically a positive signal for Atlantic tropical cyclone activity. As we know all too well, there are many other factors at play and the Atlantic Basin seems to have the most year to year variability and is subject to large errors in forecasts for seasonal activity – 2013 being a prime example. There was no El Niño that year and it appeared that conditions would be favorable for one of the busiest seasons since 2005. Other unforeseen factors set in by summer and the season was one of the most tranquil in recent memory. While the El Niño fades, another interesting phenomenon may begin to take shape. Some of the climate models are developing a very warm tropical Atlantic next year. If this comes to pass, especially if the far northern Atlantic is cool compared to average, then it would signal yet another reason to believe that changes are ahead for Atlantic activity next season. Much of this was reflected in Dr. Phil Klotzbach’s first outlook for the 2016 hurricane season which was released last week. The December discussion indicates a 25% chance of seeing a hyper-active season in 2016 which would be a significant change in what we’ve seen in recent years. A lot will depend on exactly how much the El Niño weakens and how warm the tropical Atlantic manages to get before August-September-October rolls around. Trying to put this all in to perspective, it is kind of like having a the #1 recruiting class in college basketball. Your team is loaded with incoming talent, maybe a couple of seniors with terrific skills to round things out. It appears that the next basketball season is going to be spectacular for your team. They might even have a chance to win it all and be National Champions. Along the way, things can happen: a torn ACL for your star forward. Coach gets sick during tournament play. Another player goes down with a broken hand. All of a sudden, your #1 team is now losing game after game and what looked like a sure-thing season turns out to be anything but. You just never know. Hurricane season is much the same. It really is. There can be a plethora of signals for the Atlantic Basin to be very active and yet, when all is said and done, it wasn’t and no one really knows why until after the fact. Right now we are in the equivalent of the signing period of college basketball – when the top recruits begin to choose their college. We won’t know how things pan out until much later – maybe even during the season itself. Yet, much like college ball, I see potential building for a busy 2016 in the Atlantic. However, just because something might happen, doesn’t mean that it has to happen. I’ll post an update to this blog in mid-January. By then, we will have even more data from the various climate models and the picture of what lies ahead will become just a little bit clearer.